Lidija Bajuk was born in Čakovec on Croatian north, where she graduated from the Teacher Training College and received her musical education. She has continued to perform and write for the local theatre in Cakovec throughout her career. Lidija worked as a teacher and librarian for ten years, maintaining her involvement both in literature and music before she officially began her career as a writer and musician and is currently working as a part time music editor for “Skolska Knjiga” publishing house. She has also been a member of The Croatian Writers Society and The Croatian Freelance Artists Association since 1999. Lidija is also an undergraduate student, about to pass her final exams in the study of Ethnology and Anthropology at the Philosophical Faculty, University of Zagreb. She cooperates with various well established literary and children’s magazines (“Forum”, “Quorum”, “Hrvatsko Slovo”, “Plima”, “Hrvatski Sjever”, “Knjizevna Revija”, “Marulic”, “Vjenac”, “Europski Glasnik”, “Most”, “Modra Lasta”, “Zvrk”). Lidija has published six independent collections of her poems (Osmijeh je moja najbolja obrana/Smile is my best defence 1991., Besput/Roadless Journey 1992., Razgovor s tišinom/Talking to the silence 1995., Vučica/Shewolf 1999., Sandale na vodi/Sandals on the water 2001., Pipilotine pjesme/Pipilot’s poems 2004.) and three works of prose (Z mojga srca ružica 1995., Kneja/Kneya 1999., Kneja, vilinska šuma/Kneya, the fairy forest 2001.)) Her poems have also been published in English, French, German, Italian and Spanish. Lidija started her musical career in concert, in 1987, as a supporting performer for the American singer-songwriter John Mayall, performing in Ljubljana, Čakovec and Belgrade, and later on as a supporting performer for Joan Baez in Ljubljana and Zagreb in 1989. As one of the pioneers in promoting contemporary ethno music in Croatia, she appeared on the well-acclaimed “Ethno Ambient Live/Archaic Songs of Croatia” compilation, which is considered somewhat of a classic in its genre. She also participated at the Ethno Ambient Live-Salona 98 - a project that took a new approach in promoting traditional music of this part of the Mediterranean. Her discography includes individual full-length albums “Zora Djevojka/Dawn Maiden” (released in 1997), “Kneja/Kneya” (1999), “Tira Les” (2001), and an author album “Luna” (2005). In London’s Rough Guide to World Music - Africa, Europe and the Middle East (the 1999 edition) she was acknowledged as one of the most distinguished ethno musicians of the Croatian ethno music scene. 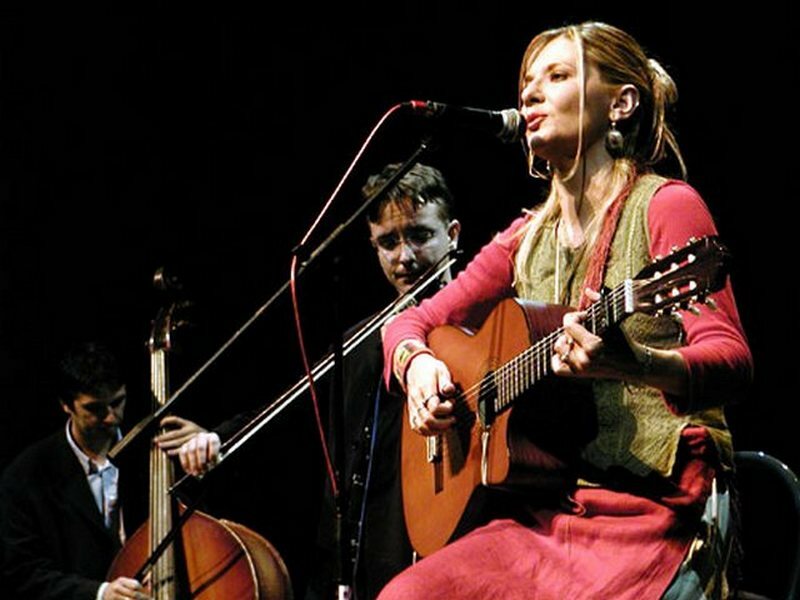 Her music was also presented at WOMEX in Essen and New Castle on two Croatian promotional releases “Magic from the Crossroads” (2004) and on “ETHNO – Croatian Ethno Music” (2005). Lidija has periodically been giving lectures on the subject Mythical symbols in Croatian traditional songs (University of Toronto and University of Waterloo 1999, AMAC Mainz 2003, Philosophical Faculty, Osijek 2004, Teacher Training College and The Faculty for tourism, Zadar, 2004) since 1999. Since 2000, she has also been conducting various eco-ethno educational workshops for children and adults. Lidija is known for her successful collaborations with a number of extinguished Croatian musicians as well as foreign internationally acclaimed musicians, such as: Dunja Knebl, Stjepan Večković/ “Lado“, “Legen”, “Cinkusi”, “Prljavo kazaliste”, Matija Dedic, KUD “Ostrc - Rude”, “Paganini bend”, “Postolar Tripper“, Goran Bare, Branko Trajkov/“Zabranjeno pusenje“ (Croatia); Ljoba Jence, Vlado Kreslin, Marko and Miha Pogacnik (Slovenia); Hans Theessink (Austria); Allan Taylor (UK); Sean and James Cannon/“Dubliners” (Ireland). She writes music for film and theatre (in 1998 soundtrack for the feature film ‘Transatlantic’ by Mladen Juran - director; in 2000 music for the monodrama ‘Jezicina’ by Branimir Glumac and Vlasta Knezović - playwrights; in 2003 for ‘Duga’ - a play based on a novella by Branko Šimunović, directed by Dubravka Crnojević-Carić; in 2004 for the play Kneya, The Fairy Forest – based on her own work, by Dubravka Crnojević-Carić – director, and in 2004 for ‘Kneya’ - a dance choreography by Darko Brkljačić). Through her work, Lidija also collaborates with various ecological and other associations (“Stribor” from Rijeka, “Nobilis” from Čakovec, “The Green Action” from Zagreb, “B.A.B.E.” from Zagreb, “Amnesty International”, Zagreb), museums (The Medimurje Museum in Cakovec and The Ethnographic museum in Zagreb), with The Institute of Ethnology and Folklore in Zagreb (performing at the 28th, 30th, 31st, 36th, and 40th International Folklore Festival in Zagreb), and libraries (in Čakovec, Varaždin, Koprivnica, Bjelovar, Sisak, Zagreb, Rijeka, Crikvenica, Sarajevo). In 1996, the Croatian National TV network-HRT produced ethnographically themed TV shows for educational and children’s programs: “ Prica o Zveglici/The Story of Zveglica” and “Ecology of Spirit, Ecology of Remembering”, which were based on her screenplays. Lidija has also received numerous awards for her music and literature including 1st prize at the “Meeting of young poets” at Poznanovec (1989), 1st prize for young poets award at “Goranovo Proljece”, The Golden Medallion, “The Herald of the City of Cakovec”, for promoting Medimurje county and the city of Cakovec trough art, music and literature (1998), “Josip Sever” Award for young poets, “Fran Galovic” Award (1999), 3rd prize awarded by a professional jury at the Festival of Acoustic Music for ex-Yugoslavia in Sivac (1988), best interpretation of an ethno song awarded by Radio Donat FM(1997), she was nominated for “Porin” (Croatian music awards) in three categories - for debutant of the year, best female vocal performer (1997) and best ethno album in 1999; 3rd prize awarded by professional jury at the Festival of Dalmatian songs “Kastela 99” (1999), "Vecernjakova ruza" Award for the best ethno music performances (2001), she was awarded with “Porin” for best folk song (2006), Kajkavska popevka Award – for lyrics - Krapina (2006) . She has performed throughout Croatia as well as Slovenia, Bosnia and Herzegovina, Macedonia, Hungary, Germany, Italy, The Czech Republic, France, Switzerland, Spain, Nepal, Tibet, Canada, Colombia and Brazil. She stood as a representative of Croatia at various literary and music festivals (Europe and Mediterranean Youth Biennale, Italy in 1997; Idriart Festival, Nepal and Tibet in 1997; at the Opening of the Croatian Embassy in Canada (in 1999), Lent Festival in Slovenia (in 1999, 2001, 2002), EBU FOLK FESTIVAL, The Czech Republic (2000), KROATISCH MUSIK IN ZEITUNGSCAFFE in Germany (2000), IBEROAMERICANO DE TEATRO DE BOGOTA, Colombia (2000), OTTOBR EUROPE, Italy (2000), SUDWIND, Germany (2001); THE BOOK FAIR, Germany (2001); EUROMUSICA Greece (2002)., EBU PRIX EUROPE Germany (2002); MARS POETICA, France (2003); Leipzig Book Fair, Germany (2004); Days of Croatian Culture, Hungary (2004); KROATISCH/SCHWEIZERISCHE BEGEGNUNGEN, Switzerland (2004); Sarajevo Days of Poetry, B&H (2004); MUSICA DE EUROPAS DE HUESCA FESTIVAL, Spain (2004); Days of Croatian Culture, Paris (France, 2004), Days of Croatian Culture, Banjaluka (B&H, 2005), MOSTRA SESC DE ARTES MEDITERRANEO, Brazil (2005), NORDPORTAL ETHNOPODIUM Switzerland (2005), Days of German - Croatian community Wiesbaden, Germany (2005), Days of German - Croatian community KARLSRUHE Germany (2006), KROATISCHE MUSIK UND IDENTITÄTEN, Germany (2006). I met Lidija Bajuk, writer/folk singer, and one of the founders of the ethnic folk scene in Croatia, at a concert at a cultural center in downtown Zagreb. A slender, blonde, long-haired woman in her mid-30’s stood on a simple stage embellished only with picture of the Old Castle and swaying fields of her native Cakovec. Lidija accompanied herself on an acoustic guitar. She reminded me of a “vila” – a fairy, one of the many mythical beings she writes and sings about. The concert began with the ancient traditional folk songs from her first solo album, “Dawn Maiden.” The melancholy song “Oh, You Golden Home” from her native region, the Lidija Bajuk, scena.hgu.hr/lidija-bajuk/ province of Medjimurje, brought back many memories. Born and raised in Zagreb, the capitol of Croatia, I wandered off in my late 20’s, first to California and then, 15 years later, to Vermont. My visits to Croatia become more frequent after the Civil War ended in 1994. During my visits, I read my poetry at cultural centers in Zagreb, had a few radio shows and exhibited my black and white photographs. I met many creative artists there. Among them, Lidija left the strongest impression. Her concert ended with a few songs from her latest album “Tira Les” (Spring Trees). This album is more joyful, collected from the area around my hometown, in a different dialect from that of her home town, which is closer to the Hungarian border. After the concert, we were all invited to share “sarma”, a traditional Croatian meal made of cabbage leaves stuffed with beef and rice. Lidija gave me her album, “Kneya” (The Fairy Forest), illustrated by one of the most talented Croatian artists, Kresimir Zimonic. A week later, I accepted her invitation to visit her home in Zagreb. Over herb tea, made with herbs from her garden, and her homemade Zlevanica cookies (made of corn meal, milk, grated apples and plums), we chatted about her life, music, writing and the Croatian ethnic folk scene. Vesna: Lidija, I think you are not only a writer and a musician, but an ambassador of Croatian folklore. Tell us something about yourself and your work. Lidija: After graduating from both the Cakovec Music School and the Teacher’s College, I got a job as a librarian and teacher there, remaining in my hometown. I often visited the Ethnology Museum and gathered information about the customs, myths, legends, folk music, art, and history of Croatia. In 1988 I moved to Zagreb, to become a professional musician and a writer. I collect and adapt ancient traditional folk songs from Croatia and also write my own songs. Vesna: You have published six books of poetry and two books of fairy tales. Can you tell us briefly about your writing? Vesna: You have performed in France, Italy, Spain, Tibet, Switzerland, Nepal, Colombia, Canada etc. You also played with many famous musicians, such as John Mayall, Joan Baez, and Sean Cannon of the Dubliners. John Mayall invited you to come to America and offered you a job as a background vocalist. Why did you turn down his offer? Lidija: I met John Mayall at a concert in my home town, Cakovec, in 1987. His offer and encouragement meant a lot, but I was a student and had commitments I couldn’t break. I don’t regret my decision to stay in Croatia. Vesna: You also played with Joan Baez? Lidija: Yes, we played together at concerts in Zagreb and Ljubljana in 1989. She had a lot of good words to say about me and my music. She gave me her autographed songbook, a cassette, and a guitar pick, which became some sort of a talisman. Vesna: The early 90’s were very difficult years for Croatia as it was going through the Civil War. How did the war affect you personally? Lidija: I think the war made me stronger and more determined to dedicate myself to my studies and my music. I felt that our concerts built strong bonds among our nations: It was a very emotional, heart-felt time. Instead of concentrating on personal wounds, people turned to something Universal: Call it God or love, and found strength within. Vesna: They often call you the “Croatian Loreena McKennit.” How would you compare yourself to Loreena? Lidija: My voice is also clear, precise and emotional. My region, Medjimurje, in the north of Croatia, close to the Hungarian border, is an old area inhabited first by Celts, Illirians and Romans, and then by the Slavs, who moved in around the 7th century. Traditional folk songs from Mejimurje carry Celtic sounds – melancholy and archaic. I perform alone or accompanied by eight musicians. I play violin and acoustic guitar, but almost all the arrangements contain some of the traditional folk music instruments: cimbalon, shepherd’s flute, reed-pipe, wood-pipe, bagpipe, ocarina…Like Loreena’s, each of my concerts is a unique experience. I choose songs that speak about love, tolerance, peace, secret knowledge and other ancient wisdom inherited from our ancestors; about the meaning in our mundane lives and our place in the Universe: To sum up, universal themes found in traditional songs throughout the world. Vesna: I think that your voice and music have a soothing and healing effect. For example, when I was lying in bed with pneumonia, I was listening to your album “Kneya” over and over again. Thanks to your music, I got well. How would you describe the healing influence of your music? Lidija: The ancient songs were sung by shamans and priests, and they carry a natural sedative, healing energy. Such songs can really benefit our health. I have even tried to heal myself with my music. Vesna: It definitely works! I guess you don’t even have to understand the language to get in touch with the power of your lyrics. Please tell us about your hometown. Lidija: My hometown, Cakovec, in the province of Medjimurje, is a small town of about 20,000 souls, but a town with a big tradition. You can find everything there: prehistory, Celtic culture, medieval history etc. It is an agriculturally rich place full of fields, forests, hills, plains and swamps. Once upon a time you could meet mythical beings there – fairies, dragons, snakes, dwarfs and newts…Those beings represented positive forces of nature that helped people. But once people started making weapons for wars, the beings retreated into the heart of the forest (kneya) and helped only those they thought deserved their help. Vesna: So you released four solo albums: “Dawn-Maiden” (Ancient traditional folk songs from Croatia); “Kneya” (the Fairy-Forest); “Tira Les” (Spring Trees, ancient traditional folk songs from Croatia); and “Luna” (original songs). You were also included on about 20 albums in collaboration with other musicians. Tell us about your new albums? Lidija: I have two albums of my own songs: “Luna” (The Moon) and “Matapur” (Butterfly). First I wrote the lyrics, then the music. They are inspired by traditional Croatian folk songs as well as by other folk songs from many corners of the world – for example, Celtic, Mediterranean, African etc. The album “Matapur” will be released by the end of 2005. It will comprise a blend of ancient traditional folk songs from Medjimurje and Celtic-influenced songs. Vesna: How would you explain the fact that a country so rich in folklore and cultural heritage is relatively unknown in the world? Lidija: Croatia is a small country with only about 4 1/2 million people and a very turbulent past. It has gained its independence only recently (1995) and does not have the financial means for promotion. Vesna: What are your current projects? Lidija: I am studying Anthropology and Ethnology at the University in Zagreb and plan to obtain a Ph.D. I am also working on some new projects for theater and film. But my top priorities are my twin daughters. Vesna: Thank you Lidija, and the best of luck. I hope we will see you appearing in the USA as well. I am sure that many students of Slavic languages and music, people from Croatia or of Croatian heritage, writers, musicians and others would love to see you on the stage. Interview conducted by: Vesna Dye, Croatian writer and translator living in Vermont, USA. Zagreb, April 2004.